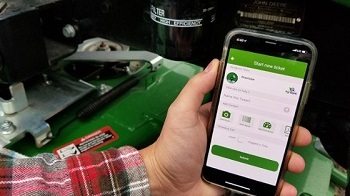 AgriSync, the leading mobile collaboration platform for agriculture, recently released a major update to its app, which gives agriculture advisors more tools to provide greater service value to customers. "AgriSync recognizes that advisors' time is valuable, so we are helping agriculture experts spend more time solving issues and less time on the required, tedious documentation like recording serial numbers," said Casey Niemann, founder and president of AgriSync. When an advisor captures an image in a ticket or a live video call, AgriSync converts that image to searchable text and attaches the serial number, product identification number, or machine hours to the ticket. � "Can you read me that PIN?" Convert images to text. Advisors and farmers can easily add product identification numbers, serial numbers, or machine hours to tickets by simply snapping a picture. Searchable metadata is automatically associated with the ticket. � Missing customer calls? Rollover to more team members. Ring additional team members if a team line isn't answered quickly. Set a priority ring schedule for a VoiceHub line to increase the odds a customer connects with someone when they call. Ring two people first; if they don't answer after a few seconds, begin ringing additional team members. � Working at your desk? Ring a landline. Advisors can adjust VoiceHub settings to simultaneously ring a mobile device and a desk phone. Advisors will also have more control when selecting VoiceHub numbers by area code, attaching PDFs to tickets, and using horizontal orientation for iPads or landscape videos. The AgriSync update features are built at cloud scale, allowing advisors to work more efficiently in responding to issues. The thousands of AgriSync users on three continents are able to immediately benefit from the latest updates. To view the updated app and see additional features, visit www.agrisync.com.